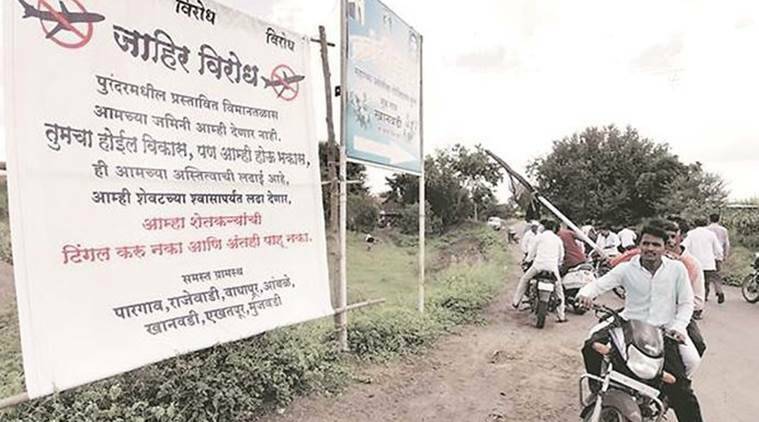 Clearing the last hurdle in the long-delayed project, the Union Civil Aviation Ministry on Tuesday gave its go-ahead to the proposed site for the new airport in Purandar taluka. The ministry’s nod comes three months after the Ministry of Defence’s No-objection Certificate, which had given a much-needed push to the project that had been stuck for many years. The steering committee appointed by the Centre cleared the site after inspecting it on the basis of various parameters. Passenger traffic at the airport at Lohegaon, a civil enclave, has increased significantly in the last few years. In 2017-18, the passenger footfall increased by 20.6 per cent — from 6.76 million to 8.1 million — as per data from the Airports Authority of India. The new airport is expected to cost about Rs 14,000 crore and will be set up across a 2,400-hectare area. “Today, I have accorded site clearance to the new greenfield airport for Pune at Purandar. The existing airport has exhausted its capacity and this new airport will help us add more passenger flights and cargo operations to the vibrant city of Pune,” said Union Minister Suresh Prabhu in a Twitter post on Tuesday. In January this year, the airport site had received the much-awaited NoC from the Indian Air Force (IAF). The MoD, however, had put forth a few conditions. They had said the Air Traffic Control (ATC) will remain at Lohegaon, all civil operations will be shifted to the new airport while Lohegaon will be used exclusively for IAF operations. Earlier, the IAF had objected to the location and alignment of the runway of the proposed airport over concerns that it would affect the functionality of the Air Force base at Lohegaon. It has also said the new runway should be exactly parallel to the Lohegaon airport runway. Later, the IAF said an angular variation of 15 degrees could be accommodated. The new airport at Purandar will be developed by state-owned Maharashtra Airport Development Company Limited (MADC). Recently, MADC officials had held a meeting with the steering committee. “A meeting was held in New Delhi on April 23, where officials from MADC, Ministry of Defence, Airports Authority of India, Directorate General of Civil Aviation, Niti Ayog, Ministry of Civil Aviation, Finance Ministry and other departments were present. A detailed presentation was given to the steering committee on covering all the aspects and reports related to the Purandar international airport,” said Suresh Kakani, vice-chairman and managing director of MADC.